Dainty pearl bracelet interspersed with faceted iridescent beads; silvertone trim; secure clasp. Dainty goldtone cross charm and Scripture disk Jeremiah 29:11. Gift bracelet is boxed with Scripture verse insert "For I know the plans I have for you" says the Lord.. Designed to fit most adult wrist sizes; disk is .75" . Keepsake gift bracelet for graduation and life's special occasions. 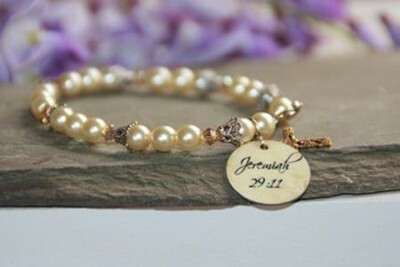 I'm the author/artist and I want to review Jeremiah 29:11 Pearl Bracelet with Cross.